Decreasing Function: A function whose values become smaller as the function argument increases. 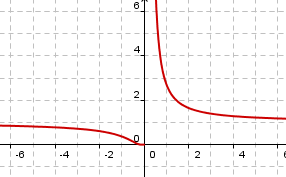 A function can also be decreasing on a subset of the domain of the function. This is usually called increasing on an interval or decreasing on an interval. Figure 2 shows the graph of y = -x2+3. This function is increasing on the interval from negative infinity to 0. 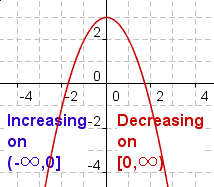 This function is also decreasing on the interval from 0 to infinity. Figure 2: Increasing and decreasing on an interval. McAdams, David E. Decreasing Function . 12/21/2018. All Math Words Encyclopedia. Life is a Story Problem LLC. http://www.allmathwords.org/en/d/decreasingfunction.html.